Yodiz Grab is browser extension that is used to capture and annotate screenshots of any web page. You can then save the annotated image locally at your machine or report as issue or user story to Yodiz. It is particular useful for QA teams as it gives them simple and quick way to report issues directly at Yodiz. There is also possibility to attach screenshot to existing issue and user story. In this help article, we are explaining how to install and use Yodiz Grab for Chrome. It is available for Firefox and Safari also. Go to Chrome App store and download Yodiz Grab for Chrome. That's it, you are ready to report bugs and user stories directly to Yodiz. It will open a drag and resizable area, select the web page portion you want to select and once ready click on "Capture" button at bottom of selection area. It will take snapshot of the web page that is currently visible in your browser area. This will take snapshot of the entire web page. Once image is captured, you can use different drawing tools available at top bar to highlight the problem area or write text. You can use "Save to Disk" option to save this image to your local drive. 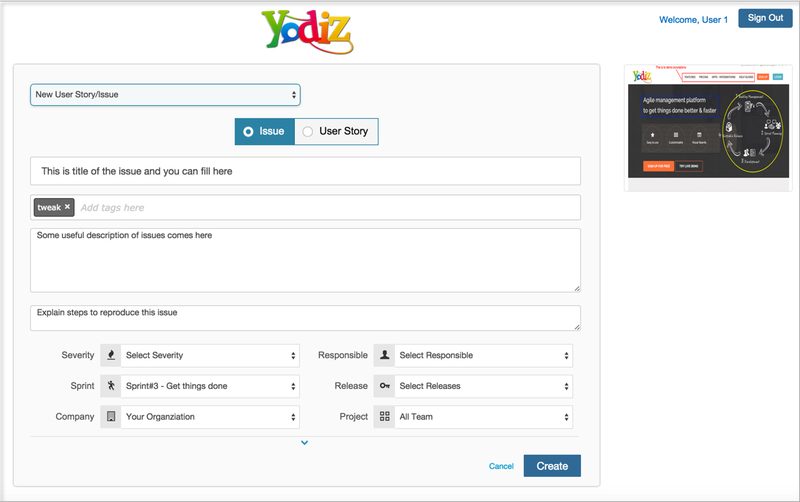 Click on "Report to Yodiz" button to send this screen shot as attachment to a new Bug or User Story. You will be thrown the Yodiz login page, enter your credentials and "Sign In". For Google apps users, please check this article on how to login. After successful authentication, you can fill relevant forms fields and when ready press "Create". If you choose first option, you will see form like below, where you can enter, Title, Tags, details and other important details. To attach captured screenshot to existing issue or user story, select this option. You can then choose the items either by ID or Title. Search results are shown in multiple rows. Click on the row and it will highlight the "Attach" option. When you press "Attach" button, the annotated screenshot will be added as attachment to selected item. Once you are done with reporting new item or update existing, you will a confirmation page along with ID and link to item at Yodiz.